This summer, I have been an intern at the Clay Art Center in Port Chester, New York. Port Chester is a town only two square miles small, sitting on the border of New York State and Connecticut between the villages of Rye Brook and Greenwich. If you are familiar with this area at all, it is perhaps due to its reputation of enormous wealth. In fact, a house in Greenwich, not many miles away from the Clay Art Center, recently left the market for 190,000,000 dollars. However, Port Chester is quite different and has been considered the ‘poor stepchild’ of the area. This name has a link to the town’s heritage as a destination for immigrants. The early 20th century brought my family, an influx of Italians. Now, the streets are lined with Mexican and South American markets. The jingle of Hispanic music can be heard from any street, and speaking only English, I feel quite inhibited when walking downtown. I mention all of this because an understanding of the community adds to the significance of my daily activity at the Clay Art Center. The Port Chester community struggles because it is estranged from the county and because most of its residents live under the poverty line. But, there is a great dedication to make improvements and Clay Art Center plays a major role in this. 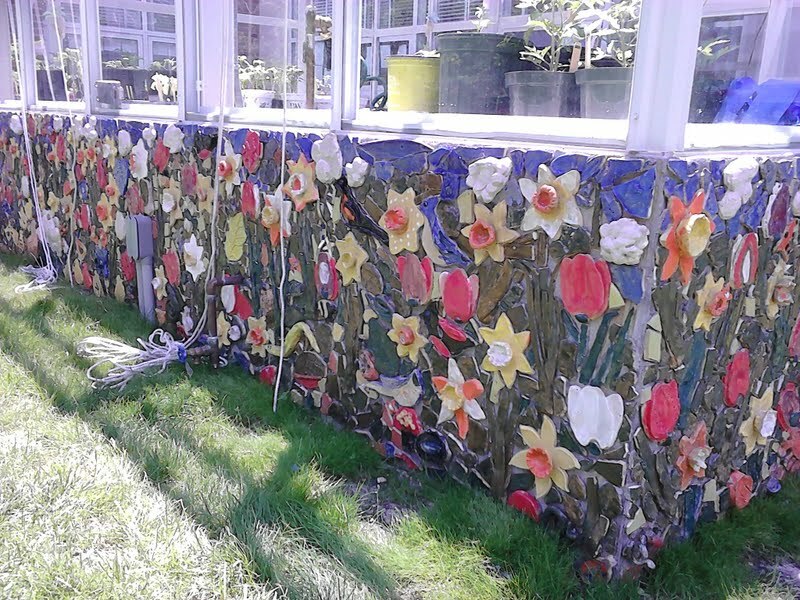 I am involved mostly in the Community Arts, where we provide after school programs for children and install public mosaics in schools and parks. Art classes were taken out of schools in the early 70’s so the center serves as the community’s only artistic outlet. I help children to make tiles, glaze and fire them, and eventually I spend long, hot installation days putting it all together on a public surface. The Clay Art Center also provides scholarship classes and camps for struggling families and I am able to assist in teaching these classes. 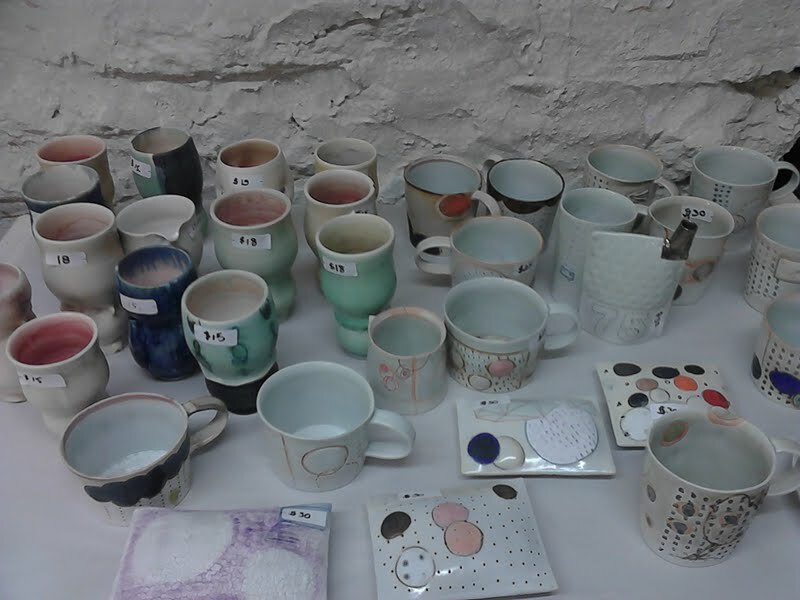 Aside from the community arts, the Clay Art Center provides permanent artist spaces for established potters, resident artist spaces for emerging clay artists, a gallery space for traveling exhibitions and a wide range of classes and workshops for people of all ages. It is the largest ceramic art center in the tri-state area. 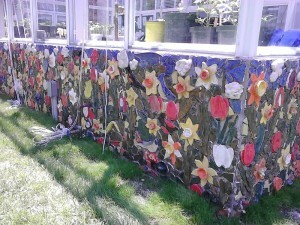 Installing mosaics has shown me how much the process lends to public projects. Almost any tile of any degree of attention or skill level can be incorporated into a mosaic and produce a beautiful result. Even people with no appreciation of the arts often see these mosaics and are blown away. It is both technically and metaphorically applicable for a community. It brings people together, forces them to be creative and adds lushness and importance to any space. I can hardly imagine what a community like Tallahassee could accomplish, with a population so dedicated to the arts. This internship thus far has sparked a huge curiosity in the possibility of public mosaics and I am surely busy devising plans of action for when I return.